The cost of replacing the springs on one or more garage doors will vary, depending on how many and what type of springs you replace, if you will do the work yourself or hire a professional, and where in the country you reside. Generally, you are looking at costs in the range of $50-$250 if you do the work yourself. It will likely cost in the range of $100-$500 if you hire a professional to install new springs. There are two basic types of garage door springs: extension springs and torsion springs. Extension springs are used on garage doors that are of light weight and also on garage doors that tilt up instead of moving in sections. They are found on the sides of the garage door but above the track. Torsion springs are used on garage doors that open in sections (with hinges between the sections). The torsion springs are found above the garage door and actually twist, or torque, to make the door go up and down. Single doors need one spring, double doors need two. Most professionals and others familiar with replacing garage door springs will advise you to pay for a professional to do the installation. Replacing the springs -- torsion springs especially -- is extremely dangerous. The spring can snap and injure or even kill you. It really is best to hire a professional. Besides the possibility for injuries and fatalities, it pays to have a professional install your springs for warranty reasons -- sometimes a warranty requires a professional installation and it will be voided if it is determined that the springs were improperly installed. Professionals also advise that if you have two springs for your garage door and only one is broken, you should go ahead and replace both springs, as the "still good" spring is likely to break soon anyway. Also, when considering spring replacements, pay attention to the intended longevity of the springs. Manufacturers will usually provide some type of expected lifespan number, such as 20,000 cycles. If you purchase springs with only 5,000 or 10,000 cycles of expected wear, they may only last about 5 years. Additionally, when shopping you should select the right spring for the right size and weight of the garage door. If you hire a professional to do the job, the costs to replace garage door springs will vary slightly depending on where you live. But generally, the midrange for parts and service to replace 1 or 2 torsion springs seems to be $200-$300. It is cheaper to replace extension springs -- the parts and installation for 1 or 2 extension springs will usually cost in the range of $100-$150. 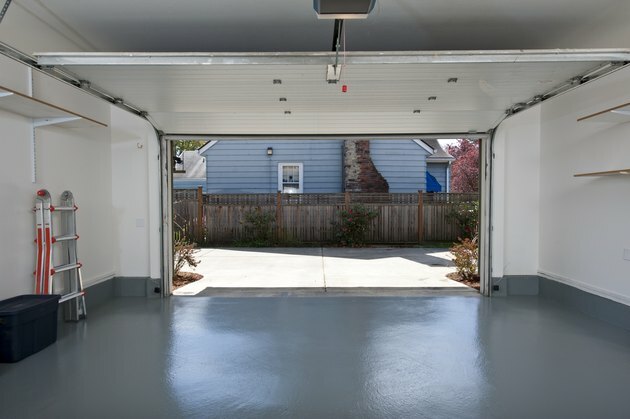 Keep in mind that once you have a professional removing the old springs and inspecting your current garage door system, there may be some other defective or worn out parts that become obvious candidates for replacement, and this will add to your costs. Something else may need to be replaced, either because of its age or its inability to operate well with the installation of the new springs. Also, if you are willing to invest the extra cost, you may wish to consider installing a completely new garage door for a number of reasons -- the current door's heavy weight, the dislike of maintenance and upkeep of a wood door, the lack of insulation, the lack of windows, the lack of storm resistant properties, or perhaps the desire for an updated garage door appearance. Donna Skekel started her writing career in 1980. She has written for newspapers and journals such as the "Journal of Information Ethics" as well as various websites. Skekel holds a Bachelor of Science in journalism from the University of Maryland and a Master of Library and Information Science from the University of Wisconsin. The Oven Door in My Kenmore Stove Does Not Close All the Way: Does the Spring Need Replacing?